Shri Mahaprabhuji is the initiator of Pushtimarg.He was born in the year 1478 A.D.at a small village named Champaranya village near Raipur in Madhya Pradesh (India).His native village was situated in the Andhra pradesh state (India).His father's name was Shri Laxman Bhattji and Shri Illamaji was his mother.From the very beginning Shri Vallabh was very dear to eveyone,that is why he was named 'Vallabh' which in sanskrit language means 'the loved one'. There is a very interesting tale connected to the birth of Shri Vallabhacharyaji.His parents were on their way to their native village from Banaras (Varanasi) when Shri Illamaji experienced labour pains in the forest of Champa (Champaranya).There she gave birth to Shri Vallabh.But both Shri Laxman Bhattji and Illamaji thought that the child was born dead and so they put him under a tree and advanced on their journey.At might Shri Thakurji gave a dream to Shri Illamaji that he himself was born as her child.On hearing this Shri Illamaji and Shri Laxman Bhattji rushed to the tree where they had placed Shri Vallabh.There they saw that Shri Vallabh was playing happily while a ring of fire had encircled him to protect him.As Shri Illamaji neared Shri Vallabh the ring automatically disappeared and she took Shri Vallabh into her lap. 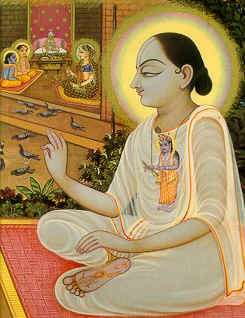 In his childhood Shri Vallabh didn't play with toys like the ordinary children but liked to play with idols of Shri Krishna or his father's books.From a very small age he was very bright.He completed the study of all the four vedas,the upanishads and the six darshans(philosophies) at a tender of only five years.He completed his education at Banaras.He defeated many learned men at a very small age of only thirteen years.He decided to start a parikrama of India when he was only eleven years old.He completed three such parikramas during his lifetime.He used to wear only a dhoti and a uparana and he always remained barefoot during his life. Constrution of the temple at Jatipura and starting of Sewa Pranalika. Shri Vallabh came to the Giriraj parvat at Jatipura during his parikrama.Here Shri Govardhannathji ordered Shri Vallabh to build a temple for him.Shriji had also given a dream to a vaishnav (Shri Puranmal Kshatri)in Punjab to come to Jatipura.He came to Jatipura and he became a sevak (devotee) of Shri Vallabh who later ordered him to construct a temple for Shriji at Govardhan parvat.In this temple Shri Vallabh started the sewa pranalika which to this day is carried on by the vaishnavas of Pushtimarg.And thus our beautiful Pushtimarg was born. Once when Shri Vallabh went to Ujjain he stayed at the Ashram of sage Sandipani.The ashram was situated at a very barren area,there was not a single tree nearby.When Shri Vallabh was doing Sandhya-vandan a leaf from a peepal tree fell infront of him. Shri Vallabh inserted into the soil and poured some water and a miracle happened,instantly a large green peepal tree sprung from the ground! Shri Vallabh completed his Bhagvat parayan beneath this tree. Once when Shri Vallabh went to Bahulavan the local Vrajwasis complained to him that the Muslim commander did now let them worship the idol of the cow Bahula arguing that he would allow them to worship it only if the stone idol ate grass. Shri Vallabh called the Muslim commander and infornt of him kept a small bunch of grass near the tail of the idol Bahula.To the astonishment of the commander the idol turned it's neck and ate the bunch! !On seeing this the commander apologised to Shri Vallabh and lifted the ban on the worship of the idol. There are many such prasangs but only a couple have been shown here. When Shri Vallabh was 52 years old Shriji ordered him to leave this world and come to Him.Before this Shriji had come twice infront of Shri Vallabh with this demand but had returned as Shri Vallabh insisted that some important work was still to be done.The time Shri Vallabh gave respect to Shriji's wish and decided to do the Asur Vyamoha Leela (leave this world).He went to the Hanuman ghat in Varanasi and took a maun vrat for 17 days.At the completion of this period he called both his sons and wrote a stotra of 31/2 shlokas known as the Shiksha Shloki as the final message to them.After giving his final teaching to his children and all the vaishnava devotees he entered the river Ganges and a brilliant flame arose from the spot and he ascended to Gauloka (heaven of lord Vishnu).He did the Asur-Vyamoha Leela on the day of Rath Yatra(Ashadh Sud 2).During his life span he wrote 39 granthas and innumerable Kirtans. The wife of Shri Vallabh as Shri Mahalaxmi Vahuji who is also known "Akkaji" in Pushtimarg.Shri Vallabh had two sons.Shri Gopinathji and Shri Vitthalnathji (Shri Gusainji).It was Shri Gusainji who,after the Asur-Vyamoha Leela of Shri Vallabh and the union of Shri Gopinathji with lord Jagannathji of Puri, spread the Sampradaya to all the different parts of the country.